Dr. Rock's Blog & Roll: Album of the Day: Queen (6/30/80) 30 Years! Album of the Day: Queen (6/30/80) 30 Years! Brit glam-rockers Queen entered the 1980’s riding the crest of the operatic, tongue-in-cheek hard-rock wave they created through five mega-albums and numerous Top 20 singles between 1974 and 1978. But The Game (released June 30, 1980) represented a sonic deviation from the immensely successful 70s formula. Gone was the promise of “no synthesizers were used on this album,” as the previous album liner notes had proclaimed. Instead, The Game included synthesizers galore, spun in with heavy disco beats (“Another One Bites The Dust”, #1 U.S., #7 U.K.), rockabilly (“Crazy Little Thing Called Love” #1 U.S., #2 U.K.) and power balladry (the reworked “Save Me” #11 U.K.). The olio of different sounds and beats created an intentionally less edgy, more pop sound than the previous albums. The change helped push The Game to the #1 spot on the U.S. chart, becoming the first and only Queen album ever to reach top spot in America. The fan base in the U.K. responded as well, but Queen had always enjoyed a strong following at home: six of the band’s first seven LP’s reached the Top 5 in Great Britain. 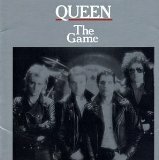 The Game sustained the Queen surge into the 80s and is arguably one of the best in their catalog. It’s available as a CD and mp3 tracks on Amazon and as iPod tracks on iTunes. You’ll find Dr. Rock’s Top 25 Queen songs in the Playlist Vault.